A mysterious series of "new" Kudu singles began to be distributed in Europe and Asia last January. By now, the two best-selling items on the website of England's Juno Records are by Ron Carter (two tracks from the 1976 LP "Anything Goes", his last solo album produced by Creed Taylor) and Esther Phillips (tracks from the Grammy-nominated "Alone Again, Naturally" released on CD, in 2008, by the Reel Music label). The 7'' singles are priced £4.25. Availability at Juno: Guaranteed In Stock! Ships within 24 hours. And don't worry: they ship to all over the world! 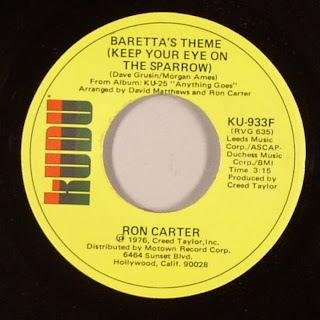 The Ron Carter item includes "Baretta's Theme (Keep Your Eye On The Sparrow)" and "De Samba". 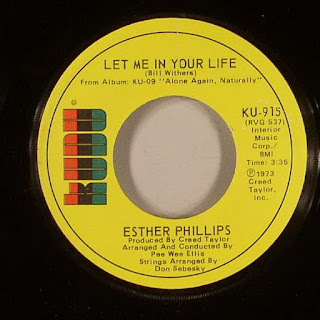 Esther's single features "Let Me In Your Life" and "Use Me," the tune that Jamie Cullum sang when he sat in with the CTI All-Stars during their concert at the Montreux Jazz Festival 2009, scheduled for DVD released this year.